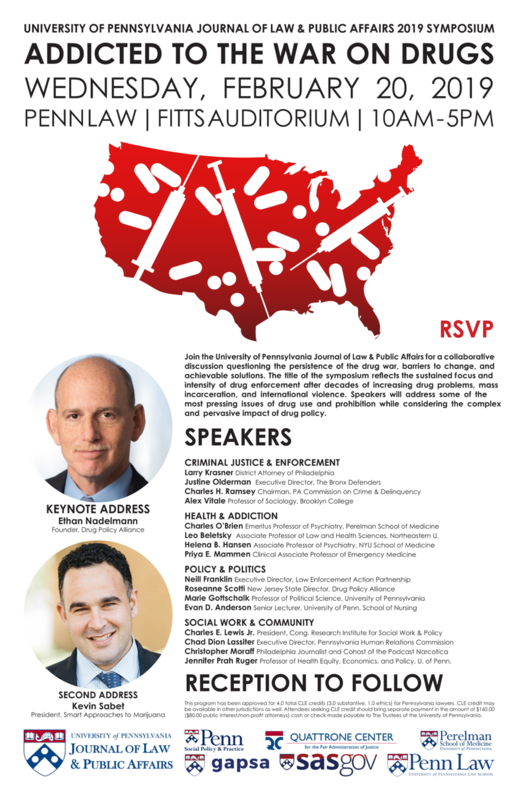 The Journal of Law & Public Affairs (JLPA) invites you to attend our Volume 4 Symposium, Addicted to the War on Drugs, on Wednesday, February 20th from 10:30 AM – 5:30 PM in Fitts Auditorium at Penn Law. This year’s Symposium consists of four panels and two keynote addresses. The Symposium is designed to address several topics related to the the war on drugs, including the intersection of criminal justice, politics, and policy, social work and the community, and health and addiction. JLPA invites lawyers, scholars, students, and others to attend. This Symposium is free and everyone is welcome to attend.